Dental floss is a thin filament used to remove debris caught between teeth and between teeth and gums. In 1994, Americans used more than 2.5 million miles of dental floss, the equivalent of circling the earth more than 100 times. The use of dental floss helps to remove plaque, a sticky, gel-like substance made of bacteria that forms on teeth and between teeth, as well as on the tooth surface below the gum line. If the plaque is not removed, it hardens and is then called tartar. If tartar is allowed to accumulate, gingivitis, or an inflammation of the gums, usually accompanied by redness, swelling, and bleeding, can result. Eventually, gums begin to separate from the teeth, forming "pockets" that frequently become infected. If this goes unchecked, the bone that supports the teeth is destroyed, resulting in tooth loss. To avoid this, adults and children over age 10 are advised to floss at least once a day. Flossing disturbs bacteria, stopping it before it can create plaque and ultimately cause gum and bone disease. Floss is available in string or ribbon form, and can be lightly waxed, waxed, or un-waxed. It is also available in several flavors such as cinnamon, mint, bubble-gum, and plain. Ribbon floss is the most effective choice when there are ample spaces between the teeth; since baby and children's teeth are widely-spaced, ribbon floss is the most common selection for children. On the other hand, when teeth have contact points, that is, when they come in contact with one another, the preferred choice is the narrower or string floss. Waxed or lightly waxed is recommended for use between crowded or crooked teeth. Dental floss is commonly made out of one of two polymers (synthetic compounds), either nylon or Teflon. Nylon is defined as a fiber-forming substance of a long-chain synthetic polyamide. A polyamide is a compound characterized by more than one amide group; an amide is a chemical related to ammonia. Teflon is the trade name of the polymer polytetrafluoroethylene, or PTFE. Other raw materials are the coatings, which may be wax, flavors, and various proprietary ingredients which vary with the manufacturer. 1 To make floss from nylon, nylon salt is polymerized and the resulting polymer is poured out as a ribbon. Next, it is cut into small chips, flakes, or pellets. These are blended, remelted, and pumped through spinnerets to form filaments. When the nylon cools, the filaments solidify and regather to form a yarn. The ends of the filaments are combined to create one strand of floss. Correctly twisting the nylon is a vital part of this process; the turns average between 2.5 and 3.5 per inch. Twisting adds strength to the floss as well as greatly reducing fraying or breaking. Since floss consists of many filaments, it can be produced in different "decitexes." Dental floss is commonly made out of one of two synthetic compounds: nylon or Teflon. Decitex is defined as the weight of 10,000 meters of unwaxed nylon in grams. Floss is also measured by "Denier." Denier is defined as the weight of 9,000 meters of uncoated floss in grams. There is a direct correlation between the numerical value of the decitex or denier and the thickness of the strand of floss: if this value increases, the thickness of the strand also increases. 2 To produce a Teflon dental floss, a polymer of polytetrafluoroethylene (PTFE) is formulated. Next, the polymer is melted into a paste and stretched into a long, thin strand. The polymer is then expanded into one or more directions. The PTFE is cut, forming different deniers. After the PTFE is processed, its tensile strength is substantial. Unlike multi-filament nylon flosses, PTFE is a monofilament, which does not shred or break easily. Therefore, twisting is not required for this process. The rates of stretching during the manufacturing process give this floss its added strength. 3 This process allows manufacturers to differentiate their products by permeating the floss with distinctive and proprietary coatings. The coating takes place in emulsion baths, where the floss is pulled through waxes, flavors, and other desired coatings at a consistent velocity. 4 Floss bobbins are next wound in one of two shapes: cylindrical or roll type. Winding the floss bobbins requires the use of equipment that transfers the yarn from one type of spool to another type. A cylindrical bobbin is dispensed through a tube or rectangular-shaped package. It can be wound where the floss is pulled through the center or pulled from the outer layer first. The advantage to this type of bobbin is that it can accommodate more yardage. The roll bobbin is the more conventional type of floss bobbin. It is dispensed through flat containers by pulling from the outer layer only. 5 The standard case for nylon flosses is an angled, two-piece construction, usually polypropylene, with an insert that holds the floss spool. Recently, many manufacturers have opted to upgrade their floss dispensers by using a one-piece "clam shell" construction that incorporates a window to gauge product use as well as grooves to facilitate gripping. 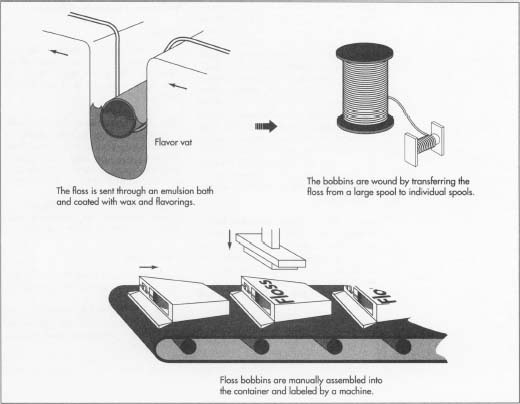 6 Floss bobbins are usually assembled manually into the floss container. The bobbin cores are cut to separate them. Next, they are placed into the container, the floss is threaded around a metal cutting clip, and the cover is closed. The package is now ready for labeling, or if the container is pre-decorated, it is ready for packing and shipping. 7 There are three basic methods of decoration: pad printing, labeling, and thermal transfer. Pad printing is the most prevalent form of decorating used in the U.S. Labeling is the preferred choice for most product exported to Europe. Thermal transfer generates an image quality equal to or better than the pad printing image with the advantage that it allows for a greater range of colors and designs. 8 Marketers prefer blister packaging (a plastic mold affixed to a cardboard backing, which can hang on a display peg) because it prominently displays the package and eliminates the need for paper packaging, which is deemed better for the environment. Another packaging trend is to co-pack floss along with a toothbrush, toothpaste, or mouthwash. Two leading manufacturers have recently developed dental flosses with new types of filament. Oral-B Laboratories introduced Oral-B ULTRA FLOSS. Unlike conventional or ordinary dental floss, which has a series of straight nylon strands, ULTRA FLOSS features an ultra strong filament, containing a patented network of interlocking fibers that resists shredding and fraying. ULTRA FLOSS' woven, spongy texture also works differently than conventional floss; it stretches thin to fit easily between tight teeth spaces, then springs back to its original thickness to trap plaque in its filament. ULTRA FLOSS is soft for sensitive gums, gentler on the fingers, and pre-measured into 18-inch (46 cm) segments, the length recommended by the American Dental Association. John O. Butler Company introduced Butler-Weave, a dental floss that acts like dental tape. This smooth, shred-resistant floss spreads out when pulled between teeth, providing more surface contact with the tooth for effective plaque removal. In addition, its thin, flat profile glides easily between tight contacts. Foster, Malcolm S. Protecting Our Children's Teeth: A Guide to Quality Dental Care from Infancy through Age Twelve. Insight Books (a division of Plenum Publishing Corporation), 1992, pp. 186-90. Holt, Robert Lawrence. Straight Teeth: Everything You Need to Know About Orthodontics, Including How to Avoid Costly Treatment for You and Your Children Through Preventive Care. William Morrow and Company, 1980, pp. 44, 121-35. Siegel, Dorothy. The Encyclopedia of Health: Dental Health. Chelsea House Publishers, 1994, pp. 70, 75, 105-106. Bedell, Thomas. "Looks: Floss, Anyone?" Men's Health, December 1991, pp. 20-21. Sangiorgio, Maureen P. "Flossing Right: The Real Truth about the Most Underrated Tooth Saver." Prevention, June 1992, pp. 108, 135-36.
i need to know the process in which flaovring is added to dental floss but there is not much detail on this webpage or any other web pages that i have found. please include information on the process of adding flaovrings to dental floss.